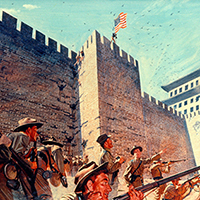 American troops participated in operations to protect foreign lives during the Boxer Uprising, particularly at Beijing. For many years after this experience, a permanent legation guard was maintained in Beijing. It was strengthened at times as trouble threatened.